Fans of Holly Black and Leigh Bardugo will be bewitched by Lana Popovic's debut YA fantasy novel about a bargain that binds the fates-and hearts-of twin sisters to a force larger than life. All the women in Iris and Malina's family have the unique magical ability or "gleam" to manipulate beauty. Iris sees flowers as fractals and turns her kaleidoscope visions into glasswork, while Malina interprets moods as music. But their mother has strict rules to keep their gifts a secret, even in their secluded sea-side town. Iris and Malina are not allowed to share their magic with anyone, and above all, they are forbidden from falling in love. But when their mother is mysteriously attacked, the sisters will have to unearth the truth behind the quiet lives their mother has built for them. They will discover a wicked curse that haunts their family line-but will they find that the very magic that bonds them together is destined to tear them apart forever? Lana Popovic studied psychology and literature at Yale University and law at Boston University. She is a graduate of the Emerson College publishing and writing program and works as a literary agent with Chalberg & Sussman, specializing in YA. 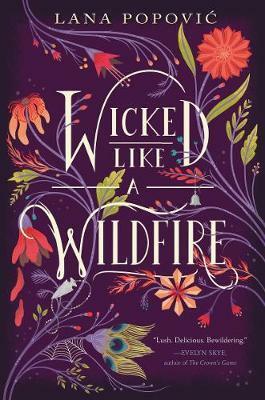 Her books include Wicked Like a Wildfire and Fierce Like a Firestorm. Lana was born in Serbia and spent her childhood summers surrounded by the seaside and mountain magic of Montenegro. She lived in Bulgaria, Hungary, and Romania before moving to the United States, where she now calls Boston home, subsisting largely on cake, eyeliner, and aerial yoga. Visit Lana at www.lanapopovicbooks.com or follow her on Twitter @LanaPopovicLit.